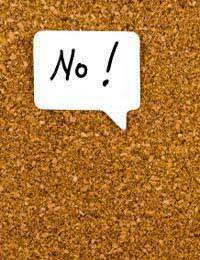 Saying no is never easy, but it’s something we all have to do from time to time. It may be to a friend, which is especially difficult, or to a pushy salesperson on the phone or in the flesh – which comes as a great relief. For some people, however, saying no can cause anguish, as they hate to refuse or disappoint. But are there good ways to say no to somebody? There are, although different situations demand different types of etiquette and communication. There’s one constant, however – you always needs to be firm, or the demands and questions will keep coming. Whether it’s family, friends or a potential date, saying no to people you know is the hardest thing to do. You don’t want to disappoint them, even though you know you have to, so often you procrastinate instead of biting the bullet. All that does is delay the inevitable no, and actually makes it harder. You don’t have to be nasty. Simply say no and give a short reason (that’s particularly true with children, where you always need to give an explanation for your decision). You might have some other plans, or you might simply not want to do something, or lend someone money. Keep your tone warm and be friendly, but by making your reason short, one sentence or at most two, you will find that it cuts off the questions and countering statements that can turn a simple answer into a long discussion. Just smile and turn away when you’ve said your short piece to stop further conversation. One of the most annoying things is to be disturbed at home by telesales personnel. It’s happened to us all, and often we’ve been sucked into a conversation before we understand what’s happening. Here you need to be very firm when you say no – although adding a thank you takes the harsh sting out of it – then put down the phone. Remember, you have the power in the exchange, and ending the call is exercising it. But do remember also that the people at the other end of the line are human, too, and simply doing their jobs to earn a living. Faced with a persistent, pushy salesperson in the flesh it becomes a little harder. They often simply won’t take no for an answer, which means you have no choice but to exercise great firmness and even be rude if necessary. Try politeness first, a simple “No thank you, I’m not interested,” and walk away. If that doesn’t work, just “No,” loudly and clearly will often do the trick. Saying no in business can be tricky at times. You might not want to ruin a business relationship, but you simply can’t do what’s asked of you. That’s where you have to walk a fine line and offer a more detailed explanation for your decision to ensure you don’t offend. At the same time, you need to be businesslike and professional. When you’re turning down requests from subordinates, much the same applies, as you want to keep the team spirit. In business you can definitely suggest alternatives and compromises that offer a way forward for both parties and which turn the negative into a positive.